Things to shake, rub, scrape, grind, etc. The PhISEM (Physically Inspired Stochastic Event Modeling) project provieded support for the "new algorithms lead to new controllers lead to new algorithms..." principles. This work on the synthesis particle-type percussion and real-world sounds led to set of new instruments, not only for control of shaker/scraper sounds and sound effects, but also for algorithmic interactive music. For example, the Frog Maraca sends MIDI commands to control a simple algorithmic fusion jazz combo of bass, piano, and drums. 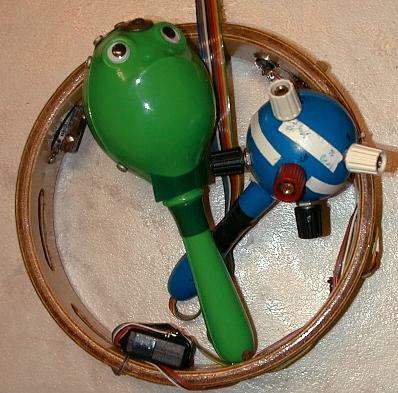 The success with both adults and children of the Frog Maraca came from its simple interface (just shake it), the fun of making fairly complicated music with such a simple and whimsical looking device, and the fact that it only perfomed one function (and always pefromed that function when tuned on). A related shaker percussion instrument controller was a Tambourine that could also compose algorithmic modal marimba solos when shaken. Constructing the PhISEM controllers provided rich evidence that "Programmability is a curse." and a correlary "Smart instruments are often not smart." What these principles are meant to address is that the programmability of computer-based musical systems often make them too easy to configure, redefine, remap, etc. For programmers and composers, this provides an infinite landscape for experimentation, creativity, writing papers, wasting time, and never actually completing any art projects or compositions. For normal humans, being able to pick up an instrument with a simple obvious interaction and "play it" only make logical sense. That the instrument is "learning from their play and modifying its behavior" often does not make any sense at all, and can be frustrating, paralyzing, or offensive. PhISEM controllers have a single embedded microcontroller, programmed for one or two functions (selectable by the state of a button on power-up), and they put out standart General MIDI signals. Except for the need to replace batteries (Die Batteries Die!!). these controllers have a strong possibility of working perfectly as designed in 10 (perhaps 20) years. Those who craft complex systems using custom hardware, multiple computers, and multiple operating systems, can make no such claims.